Add this incentive and a project cannot only pay for itself but yield excess funds as well. When the names of those who help are engraved into the surface of individual pavingstones in a large project, you offer optimum donor recognition! Identification is permanent and prestigious. The recognition becomes an integral part of the project being funded. Cambridge Pavingstones with ArmorTec are maintenance-free. 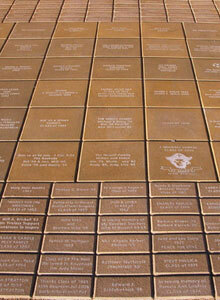 Engraved pavers attract interest in the project. Participation is easy, convenient and ongoing, even after the installation is completed. For your own personalization of Cambridge Pavingstones or for a fundraising incentive, information and assistance is available from your Authorized Cambridge Distributor.